This is a story of honesty, passion and persistence: all winning ingredients for a long succesful relationship. Stefano emailed Gustiamo last March, out of the blue. Just graduated from the Slow Food University of Gastronomic Sciences, it was difficult for Stefano to find a job in Italy. He wanted to come to work in America. Yes, and I want to become a rock star … I thought, at first! Do you know how many similar emails we receive? A lot! What made me think this was not such a crazy idea was the fact that Stefano seemed honest, had a real passion for food and he was persistent without driving me nuts. After many emails, skype calls, a meeting in Roma, visa application, Stefano’s dream came through and he is now in our office. Stefano knows (or would study) everything there is to know about Italian real food products and how to use them. He will tell you to break a bay leaf in the stew to release its fragrance (I did it, last night, when I made my beef stew: what a difference! ); what is the difference between basil from Pra and your ordinary basil; what is the proper name of the little barrels where the traditional balsamic vinegar ages for decades (vasselli). Wait until his English becomes perfect (a couple of weeks?) and watch out! 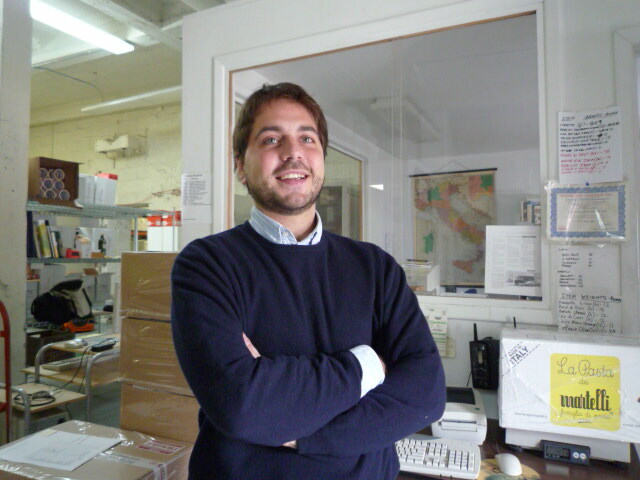 Stefano, welcome to Gustiamo and good luck to you! This is a great story! I’ve heard a little about the University of Gastronomic Sciences and have considered applying…is there any way that I can reach Stefano to ask him a few questions about the program? Sure! You can ask me everything on Unisg. I can say that is incredible experience to learn much on Italian high quality food products and on food from other country. To meet a lot people from all part of the world very motivated and very passionate on the food culture. To discover small traditional producer and taste their product. To go to Slow Food international event and compare on the “Good, clean and fair”! what did you need to know? ask! Thanks, Stefano! It’s so nice to speak with someone who has actually done the program, since it’s always hard to tell from the website alone. Basically, I am wondering whether you thought it was valuable to your career goals and whether you believe that it gave you the tools you wanted in order to “make it” in the Food Studies field. Does it focus on Europe and the Mediterranean in particular, or does it cover a wider variety of cultures and foodways? Did you find that it provided you with useful connections to scholars in the Food Studies field? These are just a few of my most pressing questions – if you don’t mind, perhaps we could friend one another on facebook? That way, I can ask you more detailed questions without taking up so much space on Gustiamo’s blog!